Cruise the famed Inside Passage, visit the mighty Niagara Falls & ascend the Athabasca Glacier on this 33 day Canadian Rockies & Eastern USA cruise & tour. Welcome to Canada! You will be met at Victoria International Airport and transferred to your hotel. This evening meet your Tour Director and fellow travellers for a welcome dinner. This morning visit the world-famous Butchart Gardens, a 22 hectare showplace of magnificent, colourful gardens. Learn about the history and flora while exploring the gardens. Afterwards enjoy an orientation tour of Victoria’s Inner Harbour, Bastion Square, Beacon Hill and residential areas. There is free time to explore Victoria or allow Evergreen to assist you in discovering more about this historic region. View this spectacular landscape from the air with a one hour floatplane flight over the Georgia Strait to Whistler (seasonal, must be pre-booked, additional cost). After breakfast drive north along Vancouver Island to Nanaimo. Board the BC Ferry and travel through the Georgia Strait to Horseshoe Bay. Journey inland along the Sea to Sky Highway as the road follows the rugged coastline with views of Horseshoe Bay on your left and forested parks and mountains on your right. You will have the chance to stop at the awesome Shannon Falls before arriving at the charming alpine resort of Whistler. This evening you are free to explore the village’s cobbled pathways and plazas. Travel through the historic farming village of Pemberton, along the scenic Duffy Lake Road lined with thick forest, into the town of Lillooet. In the afternoon we head into the mountains to the picturesque ski resort village of Sun Peaks. You’re Invited: This evening our highlight dinner involves an authentic Fur Traders presentation and feast. Today you will be rewarded with astounding views as you reach the grandeur of the Canadian Rockies. Travel through British Columbia and into Alberta, enjoying glimpses of the soaring mountains as you make your way through the three spectacular National Parks of Mount Revelstoke, Glacier and Yoho. Travel from primeval forests to Ice Age glaciers, waterfalls and mountain peaks. Late this afternoon we arrive into Banff National Park. This morning you will have breakfast with one of the best views Canada has to offer. Take the Banff Gondola to the top of Sulphur Mountain where you will witness inspiring views and enjoy a sumptuous buffet. The rest of the day is for you to enjoy Banff and its many sights and attractions. Enjoy a morning sightseeing tour including Bow River, the Hoodoos and Bow Falls. See the glacier fed Emerald Lake and the spectacular Natural Bridge, which has been carved by the Kicking Horse River. Prepare yourself for one of the highlights of your journey as you arrive at Canada’s “Diamond in the Wilderness”, the beautiful Lake Louise where you have the opportunity to stay at one of the Rockies most stunning and historic properties. This afternoon you have free time to explore this beautiful lake or relax and take in the amazing scenery. This morning we travel north along the Icefields Parkway, acclaimed as one of the most spectacular journeys in the world. Enjoy breathtaking mountain scenery as you pass rugged peaks and glaciers fringed by thick forest and shimmering lakes. We make a stop at the Columbia Icefield, North America’s largest sub-polar ice pack, where you’ll climb aboard the ‘Ice Explorer’ for a once-in-a-lifetime journey onto the mighty 300 metre thick Athabasca Glacier. The day’s end finds us in Jasper National Park, an alpine wonderland of pristine wilderness and abundant wildlife. Be taken through the park to the beautifully carved Maligne Canyon. You’re Invited: This evening we journey to Jasper Stables in the foothills of Pyramid Mountain and experience an authentic Canadian Rockies Western style dinner §. Make our way out of beautiful Jasper National Park and enjoy views of the towering 3954 metre Mt. Robson, the highest peak in the Canadian Rockies. Weave through thick forests, winding rivers and jewelled lakes and spend the night at a ranch style inn. Travel through lush countryside then reach the peaks and valleys of the coastal mountain range. Follow the fertile Fraser Valley and pass an abundance of rural scenery before arriving in the exciting city of Vancouver. Today enjoy a sightseeing tour of Vancouver including Stanley Park, the waterfront, Gastown and Capilano Suspension Bridge Park. Make your way across this spectacular suspension bridge, 70 metres above the Capilano River, and join the award winning Treetops Adventure along a series of elevated walkways. This afternoon head to Canada Place Pier to board your cruise ship. Check into your comfortable ocean view stateroom (upgrade to verandah stateroom additional expense) on the luxurious Holland America Cruise Ship ms Nieuw Amsterdam and settle-in for an unforgettable 7 night voyage through the famed Inside Passage. Please be advised that shore excursions are an additional expense and can be purchased online prior to departure or onboard your cruise ship. It is recommended to book as early as possible through the cruise company’s’ Cruise Personaliser to ensure availability. Spend the day cruising the Inside Passage, one of the world’s most spectacular waterways passing forests of spruce and hemlock, mountains, islands and inlets. Spend the day cruising the Inside Passage with its jaw dropping scenery. In the afternoon sail into Juneau, arguably one of America’s most beautiful state capitals, with the looming summits of Mt. Juneau and Mt. Roberts providing a gorgeous backdrop. The historic city centre goes back to its gold-rush origins, but nature is the priceless treasure. Established in 1897 as a trading post for prospectors headed to the Klondike Gold Rush, Skagway was an untamed town controlled by organised criminals. Today the town retains its gold rush character and its colourful past is carefully preserved in the Klondike Gold Rush National Historic Park. For a truly memorable excursion, take an optional ride on the narrow gauge White Pass and Yukon Railroad (shore excursions are at own expense). Early this morning your cruise ship enters the iceberg-strewn waters of Glacier Bay National Park, where thirteen spectacular glaciers flow from surrounding mountains into the waters of the bay. A National Park Service Ranger will help you spot wildlife, while pointing out sights and explaining glacial activity. Perhaps you will be lucky enough to see a pinnacle of ice ‘calve’ or break away from the face of the glacier, and with a thunderous boom land in the bay. Welcome to the salmon capital of the world! Part of the town is built along a steep hillside and part is built on pilings over the water, where bald eagles watch from waterside perches. Rich native history and an outstanding collection of totem poles makes the town an essential stop for anyone interested in native art. Today is a day of relaxation. Take advantage of the ship’s many outstanding facilities, or simply relax on deck with a drink and watch unmatched scenery glide by as you travel south through the Inside Passage. Disembark this morning and transfer to Vancouver Airport to board your flight to Boston (flight not included in land only bookings. Book flight after 12:30pm). The morning is free for you to explore Boston. We are joined by a local guide for a walk along the Freedom Trail, follow this journey through history which tells stories of the American Revolution which began in Boston. Visit the interesting sights of Boston Common, Faneuil Hall and the Old State House. Tonight enjoy a welcome dinner. Travel through the states of Vermont and New Hampshire, passing through Franconia Notch and the picturesque White Mountains, which come alive during the autumn foliage. Pass into Canada and the French-Canadian province of Quebec. We continue our journey to the quintessentially French city of Montreal. Montreal is a slice of old Europe mixed with contemporary design, where rich history and culture meet chic modernism. A simple stroll can lead you past 18th Century facades of old Montreal in one step and glittering skyscrapers and modern sculpture in the next. Today enjoy a sightseeing tour of the city, viewing the Olympic Complex, Notre Dame Cathedral, an intricate and historical basilica built in gothic style, then soak up the fantastic views of the city skyline from the parklands of Mt. Royal. This afternoon is at leisure to explore this historic and vibrant city. Continue along the picturesque St. Lawrence River and follow the scenic “Chemin du Roy” (King’s Road), the oldest roadway in Canada before arriving at a traditional Quebecois Sugar Shack. You’re Invited: Enjoy French Canadian country charm and hospitality and learn how to make maple candy, then partake in a delicious French Canadian lunch that showcases the local country cuisine. Visit Deschambault, a quaint village along the St. Lawrence River, then follow the historic “New France Route” to Quebec City, the UNESCO World Heritage Site spectacularly perched atop Cap Diamant. French is the primary language in this unique city, founded in 1608 as a trading post. Arrive into Quebec City in the afternoon and meet our local guide for a tour of The Plains of Abraham, the Citadel and Parliament buildings. You will then embark on a walking tour within the walls of the Vieux Carré (Old City) and visit Lower Town. This is truly a remarkable city, every building in Old Quebec tells a story and every square exudes the spirit of New France with a history dating back many hundreds of years. Spend the day exploring the quaint streets, ancient buildings and getting to know the local food and people. Leaving old-world Quebec behind, we drive through rolling countryside following the St. Lawrence River to Canada’s national capital, Ottawa. You’re Invited: Travel to a First Nations camp on Victoria Island where you will partake in an informative tour of the Native village, then witness a vibrant and interactive performance of traditional styles of Pow Wow dancing. This morning our local guide joins us for a tour of Ottawa, famous for its stately boulevards, imposing buildings and tulip filled gardens during spring. See the green-peaked roofs of the Parliament Buildings, City Hall and the National Gallery. We view the residences of the Prime Minister and the Governor General, the Royal Canadian Mint and the Rideau Canal. Travel through the beautiful Thousand Islands region of the St. Lawrence River and along the shores of Lake Ontario to Toronto. Start the day with a journey to the top of CN Tower, the tallest free-standing tower in the Americas, for some spectacular views over Toronto. Travel up University Avenue to take in the sights of Ontario’s Parliament Buildings, Queen’s Park and museum row. Visit Canada’s majestic castle, Casa Loma and step back in time to a period of European elegance and splendour. Enjoy a tour of the castle and free time to explore the magnificent gardens. The afternoon is free for you to explore this modern city. Visit the historic and beautifully preserved village of Niagara-on-the-Lake before continuing our journey to one of the most spectacular natural sights of North America, Niagara Falls. A highlight today is a thrilling cruise which takes you through churning waters past the American and Bridal Veil Falls and into the inside curve of Horseshoe Falls. Get up close to one of the most incredible waterfalls in the world and feel the mist washing over you on this magnificent cruise. Afterwards enjoy some free time or take an optional helicopter ride over the falls. Discover More: Experience a spectacular helicopter flight over the falls. This morning we cross the border into the United States and journey through the countryside of Pennsylvania and the Appalachian Mountains. Make our way to the quaint and attractive Lancaster County, home to the religious Amish and Mennonite communities who are known for their simple and traditional lives largely void of modern conveniences. This evening savour an authentic, homemade Amish feast prepared in the traditional ways. Day 29 - Lancaster – Washington D.C.
You’re Invited: Experience the way of the Amish on a tour through a local village. We are joined by a local guide for a tour around the Amish countryside to learn about the culture, faith and traditional way of life. Continue to the world’s most powerful capital, Washington D.C. home to some of the nation’s finest national treasures. Enjoy a city tour viewing such highlights as the U.S. Capitol Building, the F.B.I. Building, Washington Monument, Lincoln Memorial, the White House and Arlington National Cemetery, site of the John F. Kennedy Memorial. Spend the remainder of the day exploring some of the many museums or historic & cultural sights. Leaving the city we travel north to Philadelphia, the ‘City of Brotherly Love’ and the birthplace of a nation. You will have free time to explore the Independence Mall area on your own and see the award-winning National Constitution Centre or the Liberty Bell. Continue our journey to the exciting and vibrant New York City. A visit to the bustling and iconic “Big Apple” is a must on any trip to the USA and this thriving city will no doubt live up to its reputation. Wonder at the concrete metropolis of sky scrapers, shops, bars, restaurants, boutiques, iconic and historic sights mixed with the style and culture of the people as you soak up the New York atmosphere. Discover New York City at your own pace with an included Hop-On Hop-Off Double Decker Bus Tour. Your ticket will allow you to explore over 50 stops throughout Manhattan and Brooklyn, from The United Nations to Times Square, from Harlem to Battery Park. Transfer to New York International Airport to board your homeward flight, or consider taking in more of New York with some post tour accommodation (additonal cost, enquire for details). 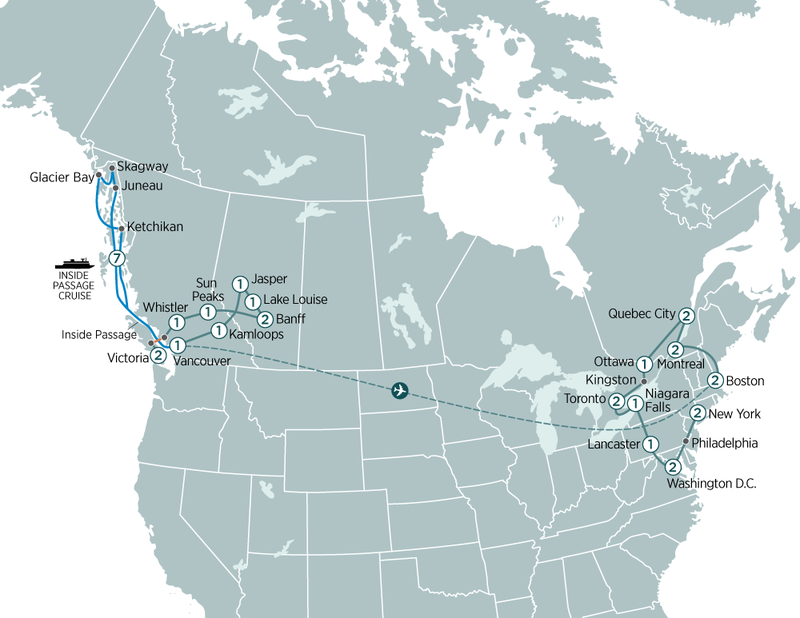 Explore Canada, Alaska, New England & East Coast USA with a 36 day tour from Victoria to New York City including both an Alaskan & Eastern Canada cruise. Discover the Rocky Mountains, Niagara Falls, the glaciers of Alaska & much more on this 36 day Ultimate Canada, Alaska, New England & East Coast USA tour. This spectacular 37 day tour includes a 7 night luxury Alaska cruise, 15 day Canadian Rockies tour and 16 day Eastern Canada & Eastern USA experience.